Portugal is one of the most affordable countries in Western Europe, and unsurprisingly, Lisbon one of its most affordable capitals. As a result, it’s easy to experience some of the best the city has to offer without putting much of a dent in your bank balance, whether you’re traveling on a budget or not. From castles and museums to tours and beaches, eating, drinking and more, here are ten things worth doing in Lisbon that’ll set you back less than ten euros. Lisbon’s castle is pretty hard to miss, perched at the top of a hill downtown above the old Alfama neighborhood. It’s a steep 20-30 minute walk up to the entrance, but once you’ve persevered, you’re treated to some of the best views in the city. For those who’d prefer not to navigate the maze of streets, tuk-tuks, trams, and taxis can get you there without the burning calf muscles. Dating back to the 11th century, and now a National Monument, your €8.50 ticket gives you access to the grounds, including walking along the old defensive walls. Expect long lines at peak times, but there’s plenty of space once you’ve made it inside. Be sure to wear appropriate footwear, especially if there's any rain in the forecast. The cobbled streets can get quite slippery when wet, and your feet will be less sore at the end of the day regardless of the weather. Lisbon’s nostalgic trams are as famous as its hilly streets, and the two things go hand in hand for weary tourists and locals alike. The most scenic line is the #28, which starts in Martim Moniz, then rattles its way on a loop through the city and out to the Campo de Ourique neighborhood, taking in many of the city’s main attractions along the way. You’ll pay €2.90 if you buy a ticket from the driver, but to save time and money, get a single or day pass from a nearby metro station instead. They're significantly cheaper, and you won't be the person holding up a long line of people as you fumble for change when you enter. Don’t forget to validate your ticket when you get on board, expect large crowds in summer, and keep an eye on your belongings—pickpockets are known to operate when the tram gets busy. If you'd like a less-crowded journey, try taking the tram in the reverse direction (ie, from Campo do Ourique back to Martim Moniz.) You'll see all the same things, but often won't have to share it with quite as many people. A visit to a tile museum doesn’t sound very exciting—but this is no ordinary tile museum. Azulejos, the beautiful blue Portuguese tiles, can be found on buildings throughout Lisbon (and the rest of Portugal), and the Museu Nacional do Azulejo does a great job of displaying and explaining five centuries of tile history. Entry is a reasonable five euros, and you can expect to spend a couple of hours exploring the temporary and permanent collections. The museum has released a free app, which also functions as an audio guide in Portuguese and English, and there's even free Wi-Fi in the lobby to download it. It’s a roughly 20-minute walk from Santa Apolonia train station, at the bottom of the Alfama neighborhood, or you could take a quick taxi from further afield. Kiosks (or quiosques in Portuguese) are everywhere in Lisbon, especially in parks, squares, and other public spaces. These small booths typically offer inexpensive drinks and snacks, and you’ll find locals making full use of them throughout the year. Whether you’re after a quick coffee before continuing with the sightseeing, or a more leisurely glass of beer or wine as the sun starts to set, grab a drink, find a table, and enjoy the experience. With an espresso as little as 60 cents, and a large wine often just a couple of euros, there’s no reason not to! You’ll almost always order at the counter, although staff may occasionally pass by and ask if you’d like another drink if things aren’t too busy. Despite its hills, Lisbon is a very walkable city, and several free tours have popped up to help visitors do exactly that. One of the most popular is run by Sandemans, typically a couple of times per day. 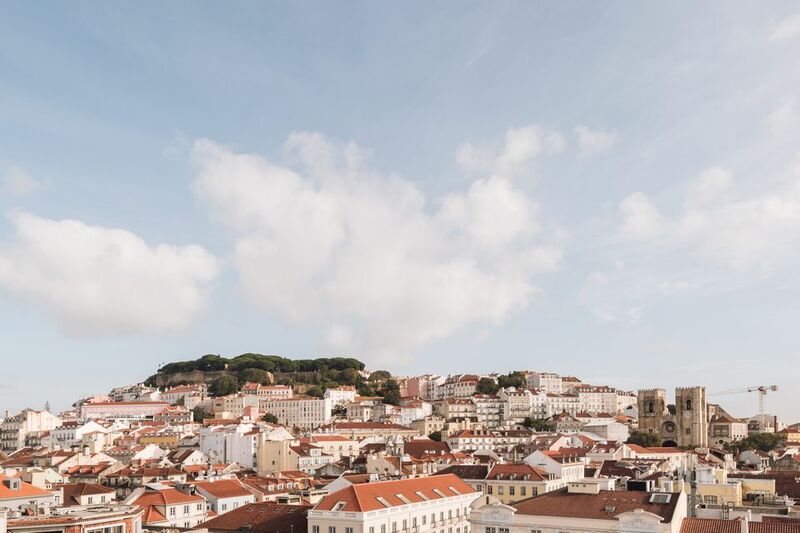 Departing from the central Largo de Camões square, the three-hour tour winds around the Alfama, Bairro Alto and Chiado neighborhoods, explaining the buildings and history along the way. Unusually for free tours like this, you can book a spot online ahead of time, and they run almost every day throughout the year. Even though you’re not charged for the tour itself, the guides get paid via tips, so be sure to give them an appropriate amount at the end if you enjoyed the experience. Perched on (or at high tide, in) the Tagus river, the small Belém Tower was once the gateway to the city for ship traffic, as well as an important part of its defenses. It opens at 10 a.m., and it’s worth getting there around that time – lines get longer throughout the day, and with only a single narrow staircase to get up to the top, they don’t move particularly fast either. Once you’ve made it up to the viewing area, though, you’ll be rewarded with great views of the river and city, and out to the Atlantic. You’ll pay €6 for an adult ticket, although you can also buy combination passes that give access to other attractions in the area, including the imposing Jerónimos Monastery. After climbing up and down those 200+ steps in Belém Tower, you’ll likely have worked up an appetite. Fortunately, the original and best pastel del natas in the city are just a few minutes away, at Pastéis de Belém. These delicious Portuguese egg tarts have become well-known around the world, but until you’ve had one from the source, you haven’t truly experienced this glorious sweet treat. Expect long lines most of the day, although you’ll get served faster in the late evening, or shortly after opening. The tasty snacks cost a little over a euro each, although if you can get away with only buying one, you’ve got more willpower than me. If you can’t make it out to Belem, you’ll pay a similar amount at other bakeries in the central city. Sure, you can take a cruise to explore the Tagus River estuary that divides Lisbon from Almada, but it’s not particularly budget-friendly. For a much cheaper, albeit shorter trip on the water, jump on one of the commuter ferries that cross backwards and forwards several dozen times a day. The easiest journey runs from Cais do Sodré to Cacilhas, and costs a little over a euro each way. The best part is the views back towards Lisbon, but once you’ve arrived, you can check out a restored Portuguese sailing ship, or jump on a direct bus to the beach at Costa da Caparica or the famous Criso Rei (Christ the Redeemer) statue. Other Tagus ferry options include a quick trip from Belem to Trafaria, or longer journeys on fast catamarans that cost a little more. For a European capital, Lisbon is fortunate to have several high-quality beaches within easy reach of the city center. Whether you’re traveling by train, bus, tram or ferry, you’ll only pay a few euros for a return ticket to either Cascais or Costa Caparica. Once you’re there, lay your towel out and enjoy the sunshine and crashing waves for a few hours. When you get peckish, there are dozens of food and drink options right beside the ocean, with cheaper options further back from the water. If you’re on a budget but prefer your beaches a little less busy, take advantage of the free bike here outside the train station in Cascais, and pedal out to Praia do Guincho instead. No matter which patch of sand you opt for though, don’t forget the sunscreen. The Portuguese sun is strong, and the regular ocean breeze means you often won’t feel yourself burning until it’s too late! The Portuguese food scene is greatly underrated — the country has some of the best seafood in the world, and local chefs take full advantage of it. As an example, there are supposedly more recipes just for salted cod than there are days in the year! While Lisbon has its fair share of high-end restaurants (including several with Michelin stars), and plenty of tourist places that’ll charge a small fortune for mediocre food, it’s easy to find delicious, filling meals for well under ten euros. Keep an eye out for the magic words ‘menu do dia’ (menu of the day) outside small, unassuming restaurants as you wander away from the tourist hotspots. Typically, you’ll get a starter or dessert, plus a substantial, often seafood-based main dish, along with water, wine and an espresso coffee, for around seven or eight euros. For tasty food on a budget in Lisbon, you just can’t go past it.